Titanic the movie: true or false? 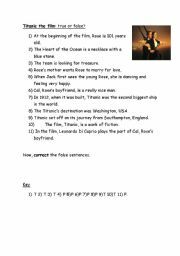 This is a true or false exercise based on Titanic the movie. 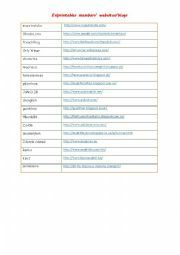 Here is a list of eslprintables´ members´ websites and blogs. All of them have free materials and the standard is very high. This was updated February 20th 2016. Six mini readings. The level of the language is quite high, but the questions just require basic understanding. You could get foundation students to give just the info as an answer and more advanced students to answer in full sentences. By the way ´eureka´ means ´I´ve found it´ and is general knowledge in the UK.